From the development of each vaccine to its use in reducing disease, Plotkin’s Vaccines, 7th Edition, provides the expert information you need to provide optimal care to your patients. This award-winning text offers a complete understanding of each disease, as well as the latest knowledge of both existing vaccines and those currently in research and development. 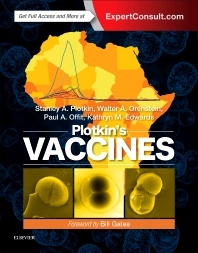 Described by Bill Gates as "an indispensable guide to the enhancement of the well-being of our world," Plotkin’s Vaccines is a must-have reference for current, authoritative information in this fast-moving field. Includes complete information for each disease, including clinical characteristics, microbiology, pathogenesis, diagnosis, and treatment, epidemiology, and public health and regulatory issues – plus complete information for each vaccine, including its stability, immunogenicity, efficacy, duration of immunity, adverse events, indications, contraindications, precautions, administration with other vaccines, and disease-control strategies. Analyzes the cost-benefit and cost-effectiveness of different vaccine options. Helps you clearly visualize concepts and objective data through an abundance of tables and figures. Chief, Division of Infectious Diseases, Director, Vaccine Education Center, The Childrne's Hospital of Philadelphia; Professor of Pediatrics, Maurice R. Hilleman Professor of Vaccinology, Perelman School of Medicine, The University of Pennsylvania School of Medicine, Philadelphia, PA.